The perfect warm weather drink is an elusive unicorn. Light and tasty? Refreshing and boozy? It’s hard to achieve all of these things in a single glass. Luckily, I have the answer. It’s time to give your summer cocktails a makeover with the zany fruit-essence flavors of LaCroix sparkling water. Although LaCroix has been around forever, its sales have tripled since 2009. I found out about it a few months ago when the cans curiously began popping up in my Instagram feeds. Then I read a glowing essay about in the New York Times Magazine in which I learned its provenance was not, as I assumed, the South of France, but rather the Midwest. The water is named after the St. Croix River and La Crosse, Wisconsin. The swooping 80s watercolor art on loan from your childhood dentist’s office will make you want to stock these cans in your fridge. But there are some other great reasons to drink LaCroix. In my search for better alternatives to bottled sparkling waters, I found that canned water was better for the environment (for one, the recycling rate for cans is nearly twice that of plastic). I also like the fact that LaCroix’s water is responsibly sourced here in the US. Plus, LaCroix tastes like fruit but has no artificial sweeteners; it’s flavored with naturally extracted fruit oils. Which is why the Coconut one does taste quite a bit like sunblock—in a good way! And that’s my final point: THE FLAVORS. There are 12 official LaCroix flavors, although I only see about half of them regularly on shelves. These are flavors which are unlike anything you’ve ever tasted in a beverage. Apricot! Passionfruit! Peach-Pear! The aforementioned Coconut. The Grapefruit is so grapefruity that they have to resort to a French spelling just to convey the true and utter grapefruitiness. It’s called Pamplemousse. And it’s délicieuse. This is why La Croix works so well for cocktails, especially ones that you must gulp down when it’s 95 and humid. Instead of stirring sugary mixers into your alcohol, you can add the same zesty splash of flavor with no added clunkiness—and lots and lots of tiny bubbles. While you can certainly swap soda or tonic with LaCroix to make a traditional drink like a vodka soda or a gin and tonic, I’ve found that it works best as a replacement for the heaviest flavor in a cocktail so you can add yet another flavor to the mix. Here are nine La Croix cocktails you can slip into this weekend. This is a lighter take on the traditional piña colada without the coconut creme and existential guilt. Although it does, indeed, taste a little like sunblock. In a good way! Combine equal parts of all three ingredients, serve with a pineapple wedge. The typical greyhound, but not typical at all because it’s pamplemousse. Salt the rim of the glass and squeeze half a grapefruit into it. Add gin and LaCroix. Garnish with a rosemary sprig. 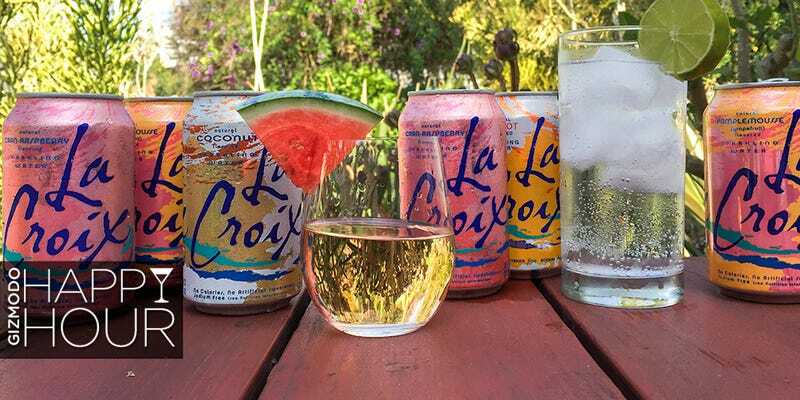 I was not a believer in spritzers but a lil’ LaCroix even makes rosé even better. Combine ingredients in equal parts, garnish with a slice of watermelon (because it’s summer). Bubbles + bubbles + one of the less-appreciated stone fruits = brilliance. Combine ingredients in equal parts and add a few shakes of nutmeg. Drop a raspberry in the glass before serving. You never knew how good sangria could be with bubbles. Combine equal parts wine and brandy, add fruits and cinnamon, let flavors combine for a few hours. Add LaCroix. Ladle out into glasses, including the fruit. Pisco is tequila’s cooler cousin. LaCroix is everyone’s cool aunt. Serve with a handful of raspberries on top. This is a zestier take on a cosmo, and you don’t have to drink it in that stupid glass. Muddle strawberries and lime with cane sugar, add vodka, shake with ice. Add LaCroix and garnish with a strawberry. A slurpee for grown ups. Combine equal parts bourbon, tea, and lemonade, freeze until almost frozen (it probably won’t freeze all the way due to the booze). Remove from fridge and scoop into glass, pour LaCroix over the slush until it’s a drinkable consistency. Garnish with a sprig of mint. Muddle lime with cane sugar, add equal parts other two ingredients, drink them both up, and call me in the morning. Thanks to Ann Friedman, Margaret Wappler, Summer Block Kumar, Doree Shafrir, Jade Chang, Carolina Miranda, and Mikey Burton (who is probably the biggest LaCroix fan I know).